(Sig Power supply $1,589 + microRendu $499) = $2,088. Vade Forrester with The Absolute Audio reviewed the microRendu - March 13, 2018. Vade said, "But the microRendu doesn’t sound good in spite of being small—it sounds good because it’s small." The Sonore microRendu is an audiophile micro computer with Ethernet input and USB Audio output. The microRendu utilizes a proprietary printed circuit board with only the essential components. The microRendu is small and light weight. 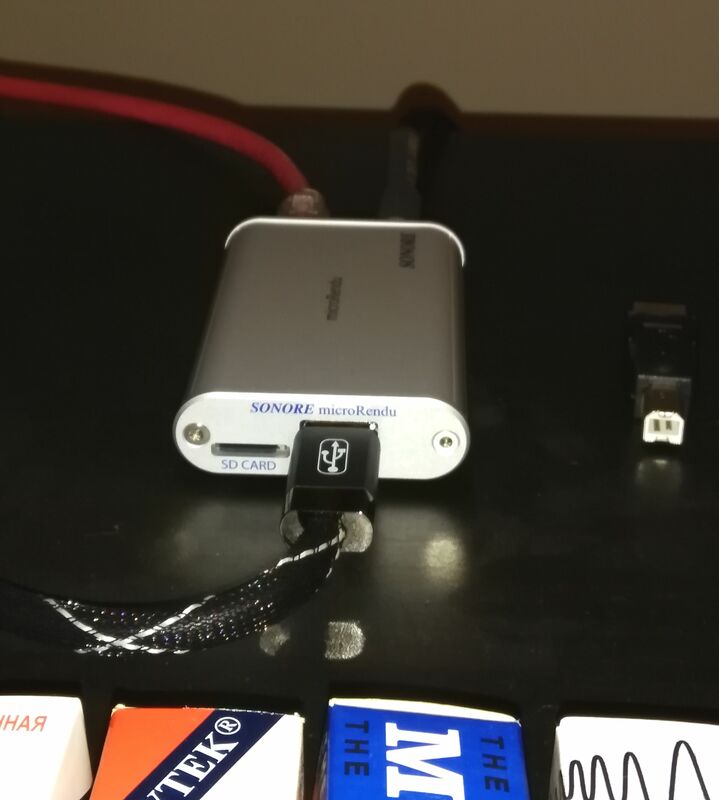 Connect the microRendu directly to your USB device via a USB cable or hard adapter eliminating the need for a USB cable. Don't let the size fool you though because it's been designed to take into consideration all that is important to USB Audio. The microRendu is easy to configure and can accept audio streams from several digital sources. What makes the microRendu different from a typical computer music server is that it's a purpose built audiophile device. The problem with computer music servers is that they all rely on mass produced motherboards designed for general purpose computing and are built to the lowest possible price point. 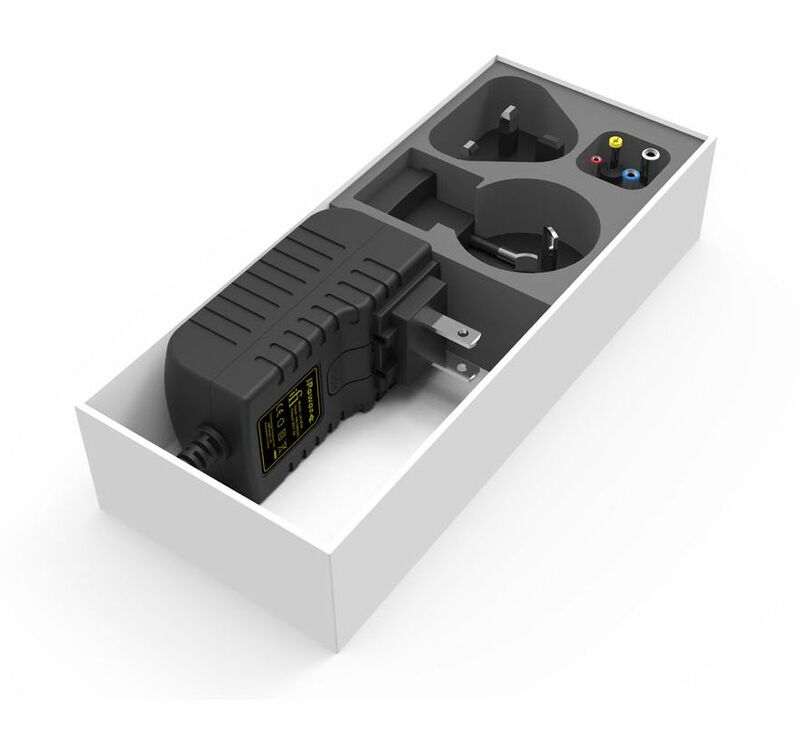 The microRendu solves this problem by removing the consumer grade computer peripherals and optimizing power supplies where necessary. The microRendu has been specifically built for processing USB audio perfectly. You can also combine the microRendu with an audiophile grade linear power supply to achieve the lowest possible noise floor. Mode #3b - MPD Output - This output is intended to work with a SMB mount. This output supports true gapless playback of PCM, DSD/DoP, and native DSD. Mode #3c - Songcast Output - This output accepts streams from your computer running Linn Songcast. The application is in Beta form. Mode #6 - Spotify Connect Output - This output can be controlled by your computer or tablet running the Spotify application. This application is based on librespot - an open source client library for Spotify. The application is in Beta form. Signature Rendu SE - single enclosure linear power supply. HIGHLY RECOMMENDED and is a true Reference Music Server loaded with the top exciting features like Roon Labs. The focus of this review is to contrast the Sonore microRendu and Signature Series linear power supply with affordable power supplies from Channel Islands Audio and iFi Audio, in a Roon-based headless environment. But before we get into that, a brief summation of the recent past: from the point when I first came in contact with Adrian Lebena at Sonore regarding the microRendu, it was August of last year, and the microRendu was all the rage everywhere. For those of you who might not be familiar, the microRendu is actually a very powerful microcomputer, and is smaller than many personal portables—it would easily fit in your shirt pocket. It contains an SD card that provides the Linux operating system that controls the device, and the only inputs are for an Ethernet connection and a power source. The only output is a standard USB-A type, for connection to your digital-to-analog converter. The microRendu allows you to stream music over your network from an attached storage device (in my case, a NAS), using your choice of music library management software to feed your digital files to your DAC. It couldn't be any less complex, and the design goal of removing your noisy computer from the playback chain is easily accomplished. Adrian and I mutually agreed a review on PF was a great idea, but with Sonore's current production run of microRendu's having recently sold out, a review unit probably would not be available for an extended period of time, which actually worked great for me. My current circumstances were that I was building a new home, and still living in my brother's basement (that we lovingly referred to as the Dungeon), with only a rudimentary headphone and computer-based audio setup going. And the timeline for getting into the new house was getting less clear with each passing day. So, no worries, no pressure, no stress, right? Of course, the review unit showed up less than ten days later (bundled with iFi's $49 USD iPower ultra low noise supply), leaving me to do lots of necessary backpedaling and explaining, regarding my ongoing personal situation and its relationship to the proposed timeline for the upcoming review. Adrian was very cool about all this, and it did give me ample time to reach out to Channel Islands Audio with regard to getting a top-notch (and reasonably priced) linear power supply they were currently developing that would work in perfect harmony with the microRendu (according to Adrian). Dusty Vawter at CIA let me know that they had a couple of prototypes for the new linear power supply, and that with a minor voltage adjustment, it would essentially replicate the production model that was being prepared, only with a generic faceplate. The power supply would have an estimated MSRP of about $300 USD. I thanked him profusely, and the power supply arrived in September. So everything basically sat around in boxes until mid-December, with delay after lengthy delay from the builder pushing things back at every turn. When it finally became apparent that we might actually move in in early January, I took the plunge and arranged for a trial of the Roon music server software, and then hooked up the microRendu and the iFi power supply to the small system in the Dungeon. By this point, I had acquired a QNAP NAS, with an additional solid state drive attached (for storage of Roon's Core), and had ported over all my music files in anticipation of the move actually occurring. I then began playing about with the entire setup to get a good working grasp of how both Roon and the microRendu functioned; you can read about that experience and more in-depth information on the NAS setup procedure HERE. I copied the folks at Roon Labs on that posting, and Rob Darling responded with a very generous offer of a seven-month extension of my Roon trial to aid with the review process. Within a month, we were moved in with most everything unpacked and set up, and with the new listening room in progress. My new room (setup is still ongoing!) is much larger than my previous space; it measures about 15.5 feet x 26.5 feet with a 9 foot ceiling height—it's almost double the volume of my earlier space of twenty-plus years. Not cavernous by any stretch of the imagination, but nonetheless, it's taken some effort to tame an insidious slap echo; I played with speaker placement and room treatments for weeks before I was halfway satisfied with the results. 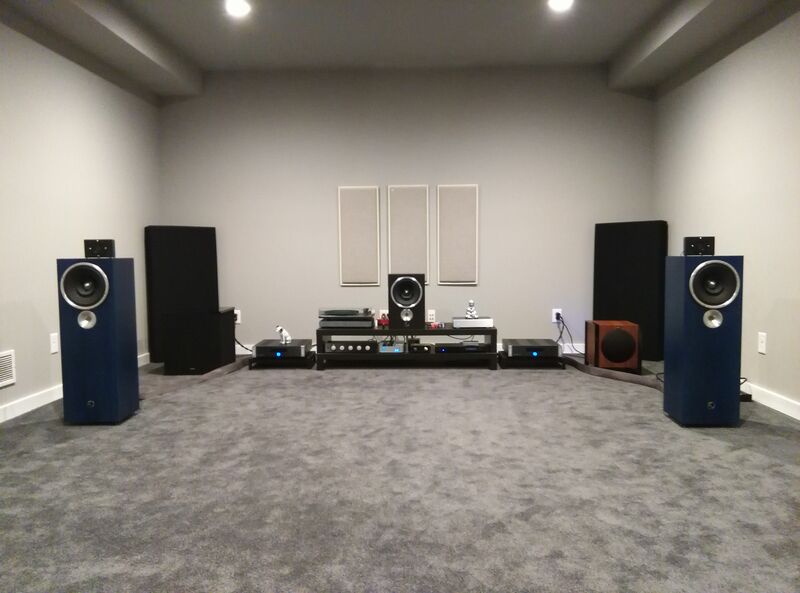 And the ongoing demands of being a working stiff, along with trying to help the wife with the continued setup, decorating, and landscaping associated with being a new homeowner has left me with precious little time to try and get everything arranged as I'd like it in the listening space. It just takes a lot of time! The room was designed to come as close as my budget would allow to matching the Cardas Golden dimensions; it's not mathematically spot-on (no thanks to my builder, who screwed things up at every turn), but is closer than anything I'm likely to own in my lifetime. I decided to err on the side of a larger room that was lacking a bit in ceiling height versus going with a mathematically correct but much smaller room. I had electrical power for all equipment set up on independent circuits, with separate dedicated circuits for amplifiers and sources. And all the remaining outlets and lighting in the room is placed on the opposite power rail of the breaker box so as to create as quiet an electrical environment as possible within. I also located all computer and network equipment in an adjacent room to eliminate any computer and RF-based noise within the stereo system. The entire house is wired with Belden CAT 6 cable, but the listening room network connections are wired with Belden CAT 6A cable. All patch cables are Belden CAT 6A from Blue Jeans Cable. All lighting is LED, and dimming is via Lutron ELV, and is completely noiseless. During my initial explorations into the microRendu while still in the Dungeon, I only used the iFi iPower device to provide power for the mR. Although its rated to deliver nine volts, and microRendu's ideal power supply is seven volts, Adrian assured me that the mR would perform ideally with the slightly higher voltage rating, if perhaps running a bit hotter. It served admirably, and the packaging for the iPower offers connection options for just about any audio (or other) device you own that's powered by some sort of wall-wart supply. It's without a doubt the finest device of it's type I've ever encountered, and while the mR sounded great via the iFi iPower, it begged for cleaner and more stable power. I don't want to understate the value of the iFi iPower—I've got numerous ancillary devices that use wall-wart power supplies, and replacing them with the iFi unit always resulted with improved performance and much cleaner sound. It's currently powering my Rolls Bellari VP-129 tube phono preamplifier that's attached to my Rega P2 table, and the improvement in sound is dramatic, to say the least. I plan on replacing every wall-wart based device I own with one of these, and pronto! But now that we're in the intended evaluation environment, I connected the Channel Islands Audio VDC 7 Mk. II prototype linear power supply, which immediately offered a clear improvement over the iFi unit. In my previous system setup at the old place, I used a JPLAY/Fidelizer software combo on my PC, along with MinimServer for management of my music library. Prior to that, I'd been using JRiver Media Center, and still had JRMC 21 loaded on the PC. MinimServer, Bubble DS and Linn Kazoo—and many of the other software packages that can easily be used with the microRendu—are based on the OpenHome architecture, which allows for substantial modifications and integration into your particular system. I had many of the parts that Adrian recommended already present in my system, with a reasonably good working knowledge of just about everything. And I'd been using Roon for about a month, so I was very interested to hear how everything would sound on the big system in the new room. With the microRendu and Roon, it's essentially as easy as point and play—you select Roon as your output mode, and then Roon finds your library and the mR, and the music plays, and effortlessly. Roon is a very powerful software suite that will manage every aspect of your music collection, in addition to offering you the opportunity to manage your subscriptions to Tidal and Qobuz. And the sound quality is superb, even if the software is perhaps a little too intrusive on the overall experience for my personal tastes. I really just want to access the music easily, and in a logical (for me) manner that allows me to locate the files I want to play with a minimum of fuss or effort. If you're wowed by intense graphics, artist backstories, and access to an absolute goldmine of metadata with constantly running 24/7/365 management, Roon just might be your piece of cake. We accept payments by Bank Wire Transfers and bank checks without 3% added fees.